Search systems, including web search engines, play an important role in decision making and action in many settings. Over the next decade and beyond, people will interact with search systems in new ways. Ryen White tells us how. Search systems, including web search engines, play an important role in decision making and action in many settings. Interactions with these systems have been studied in detail by the information science, information retrieval, and human-computer interaction research communities for decades. Despite extensive investment and the centrality of search technology in our daily lives, search is far from being a solved problem. There are many types of search tasks that remain difficult with current search systems, e.g., those where searchers’ information needs are ill-defined or exploratory. In Interactions with Search Systems , I summarize the current state of search interaction and chart a course toward next-generation search systems. I was motivated to write this book for several reasons. I had been working in search interaction for well over a decade and felt there was not a definitive textbook describing the broad range of work in this critical area. I believed it was important to show that (a) search interaction is an important domain that encompasses more than just search interfaces, i.e. the book also spends considerable time on data, modeling, and evaluation; (b) searchers’ expectations are evolving (e.g., greater need to access information at any time and from anywhere) and important challenges in supporting search interaction remain unaddressed, and; (c) those challenges can be overcome via new technologies, and a deeper understanding of searchers and their search situations. Writing the book also provided an important opportunity to reflect on the current state of interactions with search systems and cast an eye toward a future where they can be better supported. Figure 1. Next-generation search systems represented as personal assistants equipped with advanced capabilities to sense and model the search context. Examples of signals and resources present in the search context are provided in the figure. Over the next decade and beyond, people will interact with search systems in new ways. Advances in technologies such as speech recognition and computer vision, new interaction capabilities such as touch and gesture, the shift toward mobile devices and the emergence of cloud computing, and the democratization of artificial intelligence, will all change the search landscape. Rich interaction data, collected at both large-scale (for populations of users) and small-scale (for individuals), are essential to facilitate many of these advances. In working with these data, user privacy and data reliability are paramount. Search providers must gather and store searcher data in a responsible and privacy-preserving manner, provide searchers with clear details about how they benefit from sharing their data, and correct any biases present in the data and user sampling. Next-generation search systems will provide reactive, proactive, and iterative (dialog) experiences to understand their users’ needs and help them find information. Moving beyond the query-response paradigm that is epitomized by web search engines, search systems will also help searchers to explore and learn about new topics and domains, and facilitate effective decision making and action . These systems will be personal and contextual, engage in a natural (human-like) way, and be ubiquitous (available across applications and devices, with access to a broad range of signals; all collected with searcher consent). Deep understanding of searchers and their contexts is necessary to adapt system responses to their current situation. Natural interactions, such as conversations, will enable search systems to more fully understand searchers’ requirements. Ubiquity has additional advantages beyond enhanced availability, e.g., data collected across applications and devices affords a more complete understanding of searchers’ tasks and their progress, enabling sophisticated inferences such as automatically detecting task completion and providing support for task resumption. Search providers are already pursuing many of these and similar advances to empower their users and support activities that they value. There are also significant and exciting challenges in how to make search systems operate seamlessly alongside, or evolve into, intelligent personal assistants such as Amazon Alexa or Microsoft Cortana. 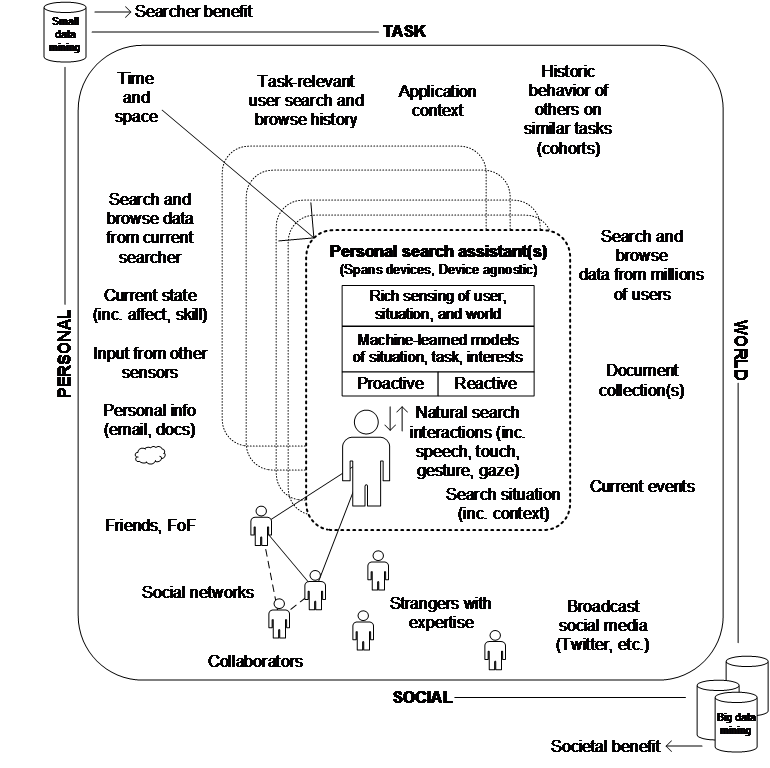 Figure 1 (taken from Chapter 3 of the book) illustrates the central role that these assistants can play in helping people search more effectively via signals, resources, and knowledge from many contexts, including the task, the searcher, and the expertise and experiences of others. White, R.W. (2016). Interactions with Search Systems. Cambridge University Press, New York, NY. White, R.W. and Roth, R.A. (2009). Exploratory Search: Beyond the Query-Response Paradigm. Synthesis Lectures on Information Concepts, Retrieval, and Services, 1(1), 1-98. Morgan and Claypool, San Rafael, CA.